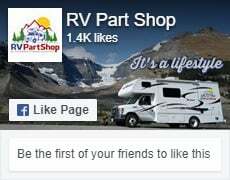 Love RVPartShop -- great customer service, quick and reliable shipping and the product is always what we need or want! Thank you!! Sway bar works WONDERFULLY!! Answer: Thanks for your exceptionally kind comments, we love our customers too! Agent I dealt with efficient polite and knowlegable. Delivery was very prompt! Answer: Thanks for your comment. Managing such a large number of products and presenting them so people can find what they are looking for easily is always our goal. Glad you found it to be good. So pleased with the personal and informative service!Thank you. Answer: You are most welcome, happy to help. The parts person I talked to was courteous and informative. In a matter of minutes what I needed was ordered. Great Day!! Answer: We're pleased you were happy with your experience. Thanks for your business. Answer: Thanks for your comments, not sure what you mean by a Visa option, we do accept Visa, Mastercard, Paypal and (now) Interac as payment options. Answer: 0Happy your experience was positive, thank you for your business. Took a couple of phone calls but otherwise staff was courteous and prompt, especially Richard. Answer: Yes, sorry, this one took longer to sort out than we would have liked as well, but we appreciate your patience and support. Never been to shop, can't rate it. Answer: Thanks for your comment. We do not have a retail store, so you have shopped the only place you could with us, and we're happy that you had a positive experience. Answer: Thanks, glad you were happy with the product and service. Great service, selection, and fast shipping. What more could you want? Answer: Thanks for your review, it is appreciated. Answer: Glad you have a positive experience. Thanks for your comments. Ordered a stabilizer jack for my trailer on the weekend and received it Wednesday morning in Victoria, well packaged and just as described. offers items from Canada and the USA so no border hassles, quick delivery. site was easy to find parts on. will use them again. Answer: We appreciate your support, thanks. Answer: You're very welcome, thanks for your business.